Three sets of spring babies have popped out this week. 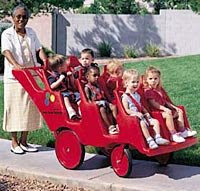 At our St. Benedict Child Development Center the 6-seater buggies have appeared from their winter garage storage. The teachers load them up with children from our East Coast Migrant Head Start Program and head off around the block on East 9th Street. When I looked into the newly added infants' room a couple of years ago it was the first time I had seen a room full of babies without one towhead among them. But I soon forgot that blond, blue-eyed look as those big dark eyes and shiny black hair radiated from the roomful of Hispanic babies. I never get enough of these scenes. The kids are so cute and these buggies are amazing. They are that large, heavy-duty red plastic and look like a giant version of a Fisher-Price toy in some playground. They must do the trick for they've been around for years, look like new every spring, and the kids seem to love the royal treatment as they sit back and peruse their "neighborhood kingdom" from their comfortable perches. The second set comes as goslings and baby ducks. We saw some at our peninsula (Presque Isle State Park) this weekend and are sure to see a family or two soon at the plastics plant pond about a half mile up the road. This photo is exactly how they look. The third set of spring babies is a trio of baby robins we saw this week in an evergreen tree down at our Glinodo Center near the lake. We tried to get a photo but, even though we could see them quite clearly ourselves, it was too dark 18" inside the branches for the camera to distinguish them--they are just three little heads resting on the nest's edge.